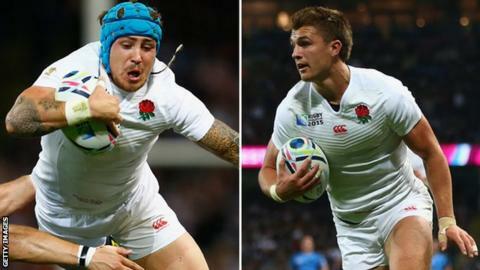 England may have fared better at the World Cup had Jack Nowell and Henry Slade been given more chances to play, says Exeter Chiefs boss Rob Baxter. The Exeter duo only featured in the final game against Uruguay. Nowell scored a hat-trick of tries and Slade one as England exited the tournament at the pool stage. "I think really the results of the other games have vindicated that potentially there were some selection issues," Baxter told BBC South West. England's coaches decided to pick Sam Burgess ahead of Slade at centre for the loss to Wales, while wing Nowell was left out of the first three games in favour of Gloucester's Jonny May. "I was a champion of trying to get Henry into the 31-man squad, I thought it was exactly the right thing to do to get him in there," said Baxter. "Unfortunately, when the opportunity was there to use him as a second playmaker within the England back line, that opportunity wasn't taken and, as you can see, the rest is history. "It was frustrating for Jack as well, as he hadn't done anything wrong. Jack had a fair bit of good exposure and good experience and hadn't played poorly. "All Jack had suffered from was being left out of the team after he'd played particularly well against France (a 25-20 World Cup warm-up defeat) and was probably one of England's standout players. "I know he was very frustrated that he never got the opportunity that the other back three players did, and again ultimately his non-inclusion in the 23 again came back to haunt England."